John Smith was born in Willoughby, England in 1580. There he received the equivalent of an elementary education. As a young man he became an apprentice merchant. In 1596, after the death of his father, Smith decided to become a mercenary soldier. First, he joined volunteers in France who were fighting for Dutch independence from Spain. Then, two years later he worked on a merchant ship in the Mediterranean Sea. In 1600, John Smith joined Austrian fighting forces and fought against the Turks in the “Long War.” Soon afterward, while fighting in Hungary, he was made a captain. 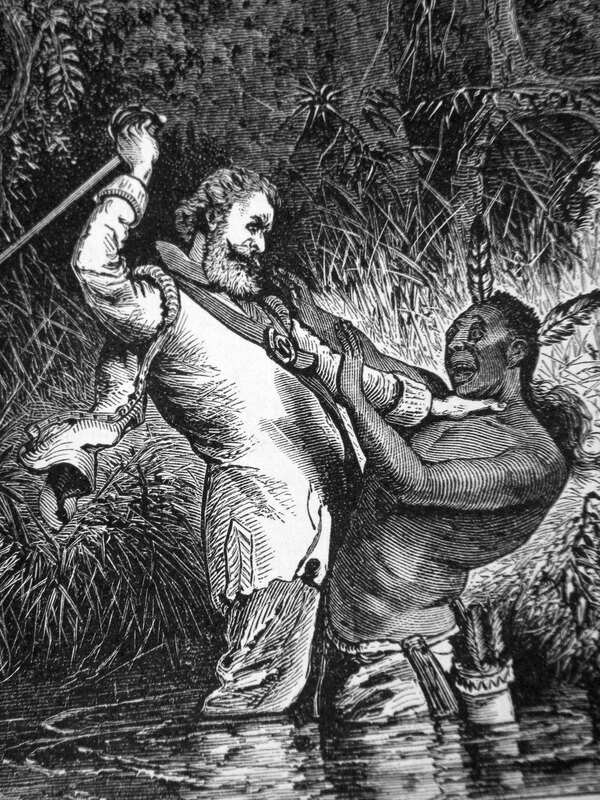 Then in 1602, while fighting in Transylvania, John Smith was wounded and sold into slavery. His owner was a Turk, and exactly how he escaped is probably more myth than truth, but what we do know is that by the winter of 1604-5 he had returned to England. He would later write an autobiography about his adventures in Turkey and on the Mediterranean Sea. In 1606, a group of investors incorporated the Virginia Company, and soon afterward King James I granted them a charter to establish the colony of Virginia. The same year, John Smith joined the group of Englishmen that sailed across the Atlantic Ocean and established the colony of Jamestown. After landing in Jamestown, in April of 1607, John quickly emerged as a capable leader. Unfortunately, he and the first colonists faced horrendous hardship. Almost as quickly as they arrived they died from disease and hunger. Only 38 of the 104 colonists made it through the first winter. Another group of 220 colonists would arrive in December 1609, and by spring there would only be 60 of them still alive. Before long, Captain Smith took command of the colony. He forced the colonists to work 6 hours a day in the fields. However, they all wanted to search for precious metals, but all they found was mica. John tried to convince them that it wasn't gold, but the colonists wouldn't listen. Soon the colonists complained bitterly about working in the fields. Most preferred to go bowling in the streets. They soon united and in October of 1609, they forced John out. The results of his removal were immediate. The colonists neglected to plant sufficient crops and they died by the hundreds from hunger. Between 1602 and 1622, the Virginia Company transported over 10,000 people to Virginia, but only 20 percent were still alive in 1622. Before long, the relationship between the Native Americans and the starving colonists and the Indians turned for the worse. Especially when 17 colonists invaded a Native American encampment where they were killed. The Indians left there bodies on the ground with their mouths stuffed with corn. Next, the colonists decided to kidnap Chief Powhatan, but before they had a chance Captain Smith walked into an ambush and was captured. Exactly what happened after that is probably more myth than truth. According to the story, just as Powhatan was about to kill Smith, his daughter Pocahontas stopped him and saved Smith's life. In September of 1610, John was wounded in a gunpowder explosion. He was forced to return to England for medical treatment. He would never return to Virginia again. However, in 1614 he sailed form Maine to Cape Cod looking for gold. Smith didn't find any gold, but it was during this trip that he named the area we now call New England. He named it New England because he believed that the climate and soil were very similar to the mother country. John Smith's salvaged his trip financially by returning to England with a boat load of furs and dried fish. Shortly after returning he entered into the publishing business. Largely, he wrote pamphlets promoting New England. He also published maps and several books that helped guide the future colonists.